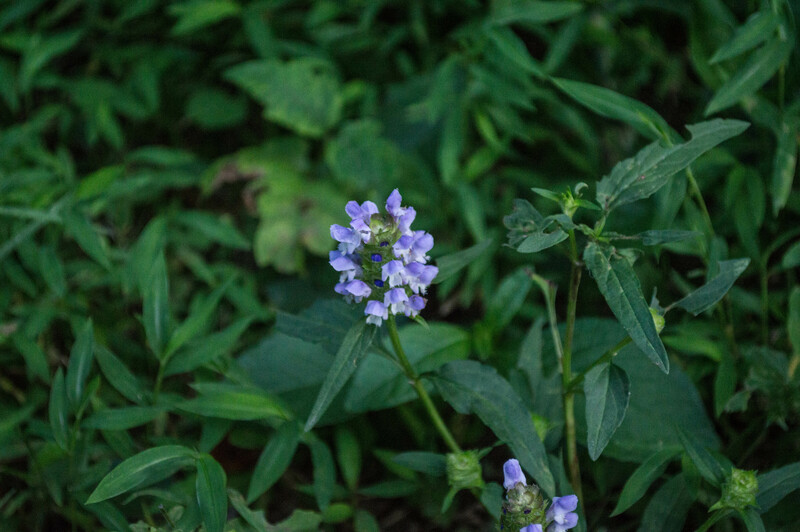 This common ornamental groundcover is grown primarily for its ability to thrive in dry shade. It’s a handsome plant, with purple- or bronze-tinted or variegated evergreen or semi-evergreen leaves, and forms dense mats via above-ground stolons that run and form new plantlets. It’s established in much of the eastern US as well as the Pacific northwest. Whorls of blue-purple flowers appear on short spikes in late spring. A popular herb in Asian cuisines, shiso is an escaped kitchen garden plant. There are vast swaths along the C&O canal from Great Falls to Carderock and elsewhere. Once I spotted a few women there harvesting the leaves. I had mixed feelings about that: on the one hand, destroy the invasives! On the other, foraging in national parks is illegal, and for good reason. Anyway, this plant can get to three feet tall, and features large, wrinkled, purple-bronze leaves that are heart-shaped and coarsely toothed. The small white flowers appear on racemes in summer. There seems to be some confusion about whether this plant is native to the US. ITIS recognizes three subspecies: P. vulgaris ssp. aleutica, ssp. lanceolata, and ssp. vulgaris. BONAP shows two species in the US, P. vulgaris (native) and P. laciniata (alien). Presumably P. laciniata and P. lanceolata are the same. But then, according to the Weakley Flora there are both P. laciniata and P. vulgaris ssp. lanceolata. 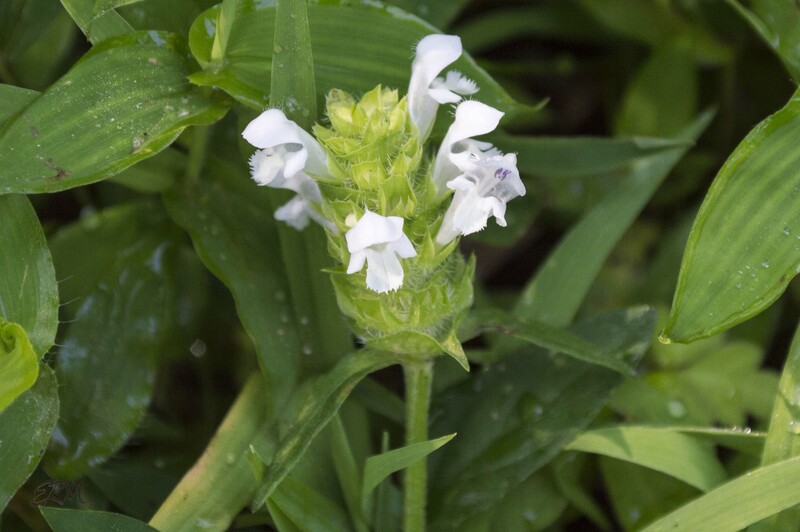 Whether alien or native, self-heal is recognized by several authorities as weedy. I see it blooming along the C&O Canal towpath, leading me to believe it likes sunny areas in dry, disturbed soils. It’s common there, but not exactly weedy. The blue or sometimes white flowers are borne in short spikes in mid to late summer. There are three commonly confused, purple-flowering weeds that seem to be everywhere: ground ivy, henbit, and deadnettle. For more information, check out the post on identifythatplant.com. This very low-growing plant has stolons up to seven feet long, forming new plants at the nodes, and thus covers large areas in mat-like growth. The small, round leaves have rather long petioles, are indented at the bases and have scalloped margins. The flowers are borne in pairs of cymes in the leaf axils, each cyme having only a few flowers. 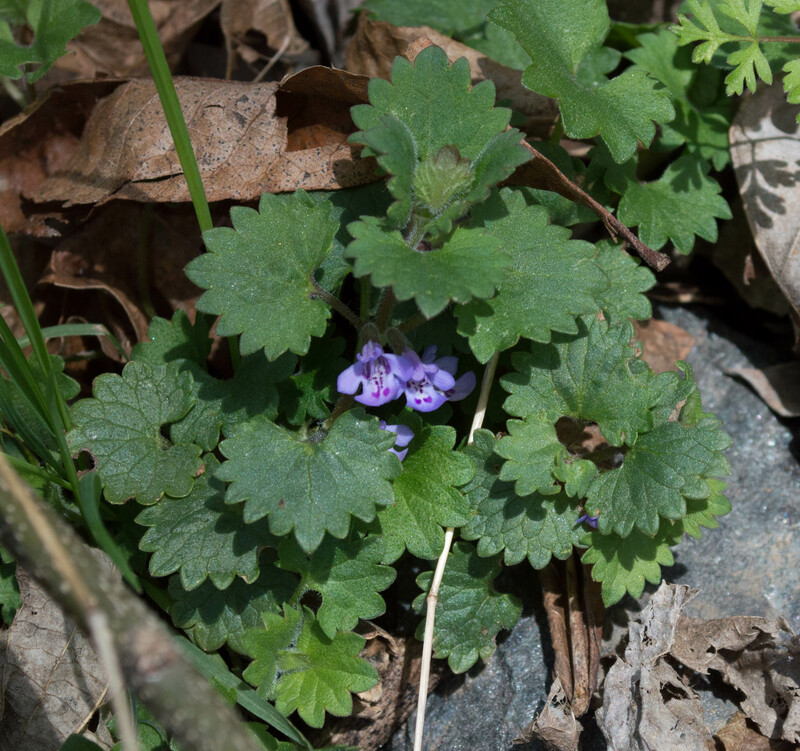 Ground ivy is established in most of the US and Canada (except the desert southwest), and is listed “potentially invasive, banned” in Connecticut. In the Potomac gorge there are areas many square feet in size covered in nothing but ground ivy. Native to Europe, Asia, and north Africa, this low growing annual is established in almost all of the US and Canada except the Arctic regions. It’s a sprawling plant, but maybe not as mat-forming as ground-ivy, from which it’s distinguished by the leaves, which are about the same shape, but on the upper part of the stem they’re sessile so that they appear to entirely surround it. The stem is often red. The flowers are borne in sessile whorls in the leaf axils, and in terminal whorls. 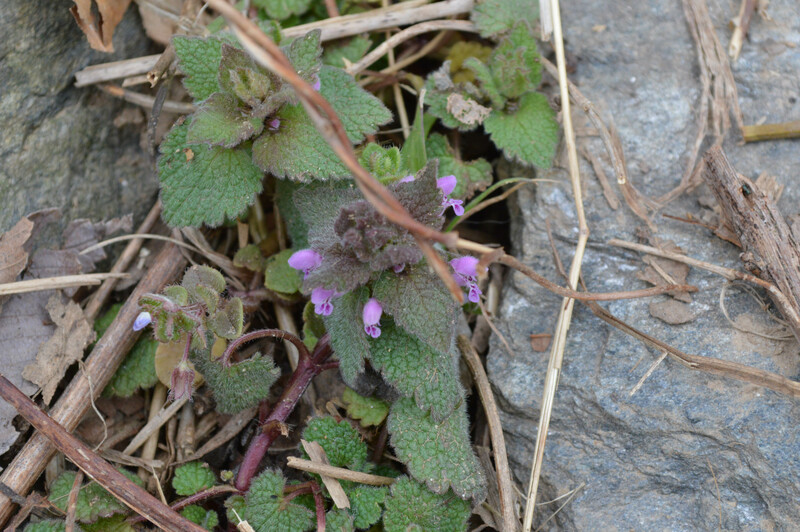 Purple deadnettle is not quite as widespread across North America as henbit is. The green stems stand upright (instead of sprawling), and the uppermost leaves are somewhat purple or reddish. The leaves have a somewhat more pointed shape, short petioles, and occur only on the upper half of the stem. This entry was posted in Uncategorized and tagged Lamiaceae by elizabeth. Bookmark the permalink. And thank you for saying so!